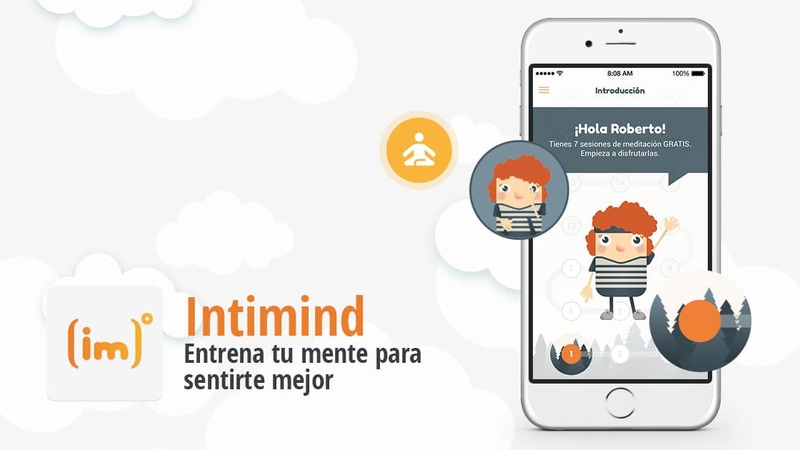 Intimind, the meditation app developed by Cuatroochenta for a bold team of psychologists in Valencia, has been highlighted by Google Play among the best in 2017 in Latin America and, more specifically, in the category of “Most Entertaining Apps”. This is the culmination of a year with a brilliant track record, in which the app has unceasingly provided new incentives to connect with its users, leading to recognition in the flagship media in Spain and America, such as El Paísor Televisa. The main merit of Intimind consists in converting the mobile phone, usually associated with hyper-connectivity and stress, into a tool that brings serenity to our life, to assist in the habit of taking a break each day to meditate. Spearheaded by Imma Juan, the team that specializes in the full attention method, mindfulness, has managed to find the way of spreading dozens of guided meditation practices in Spanish in sessions of just 10 minutes. During the last year, this has lead to thousands of downloads of the app in Mexico, Chile, Colombia, Spain and Argentina, both on iOS and Android, as we reported last summer. It even grew into a benchmark meditation app in Spanish, as illustrated by Google Play’s recognition, in a ranking available these days to the users of its store when they access it in countries like Mexico, Colombia, Argentina, Peru and Uruguay. In those countries, Intimind features among the 140 most outstanding apps of 2017 and, in particular, among the “Most entertaining” 5, which according to Google Play are “not to kill time, but to make the most of it”, as leading media such as El Tiempo (Colombia) or El País (Uruguay) have reported. Intimind shares its position in the ranking with Socratic, an app to help pupils with maths and other homework, considered by Google Play as the best of the year throughout the world, for its utility and “intelligent and attractive design”, or the video game CATS (Crash Arena Turbo Stars), for its “attractive graphics” and its “incredibly intuitive interface”. Behind Intimind there is a specialized group of renowned psychologists, with a clear concept as to which techniques to disseminate, the format and how to connect with the public, and who stick up for their creation at all times. This is a lively app, which is permanently up to date with new techniques, including promotionsto persuade the public and monetize on them, the last one on occasion of Black Friday with a 50% discount on the payment features. The app, designed and developed at Cuatroochenta, provides an excellent user experience (UX), due to careful design of interfaces (UI) and interaction (IxD). Intimind has been able to respond to specific audiences with mindfulness techniques specifically aimed at runners, children or families, for example. The various channels of Intimind report on those updates and custom techniques, with an updated blog, a very active video channel, dynamic social networks or mailings; but also on the promotion of the world of meditation in general to build community. This painstakingly long work and excellent media relations have resulted in a significant impact on mainstream media and influencers, as is the case of the magazine S Moda by El País, the show on technology and innovation of the Televisa network, Fractal, or the blog by Sara Carbonero in Elle.